Yikes this week was hard. I should have taken pictures during the week and there wasn’t and still isn’t much to look at since it is just a line drawing at this point. The original plumb line and horizontal were easy. We used a level to find those. The angle of the face though, I had to correct that over and over. I would think I had it correct and start drawing. Then I would realize that something was off again. Measure again, move the line, draw again, and it is off again. Argh!!!! Another huge learning curve this week has been working with charcoal. My hands are used to working with graphite more than any other drawing media. Charcoal is both clumsy and subtle at the same time and requires practice, practice, practice. 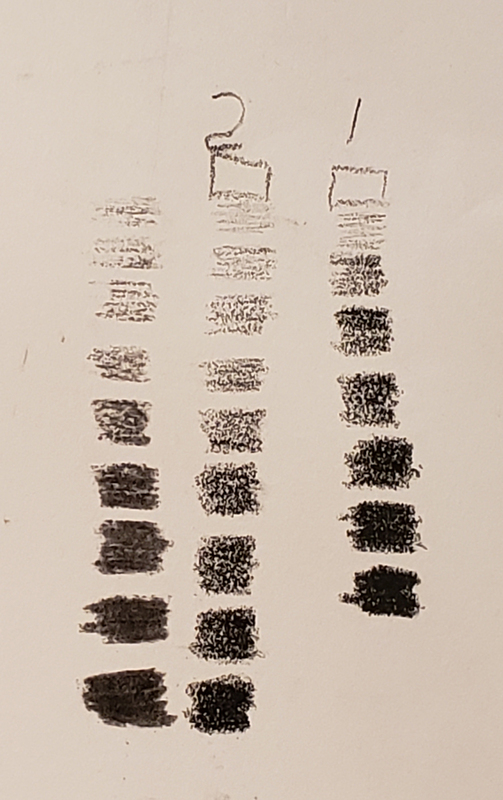 The charcoal pencils are not the same thing at all. They don’t erase, the texture of the pigment is coarser even with the softest charcoal pencil. I didn’t figure this out until I started practicing my “scales”. 1 and 2 were done with a soft charcoal pencil. 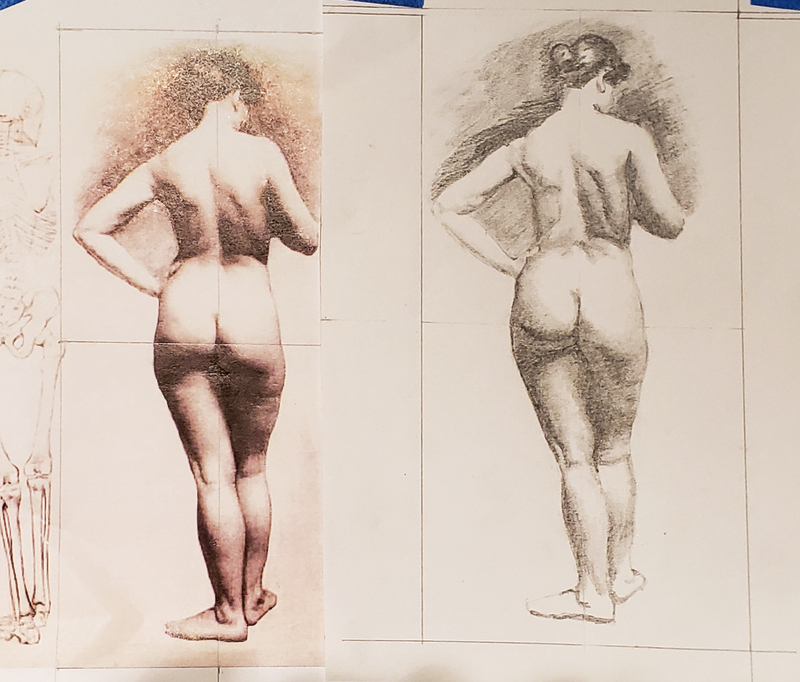 The far left was done with soft vine charcoal. It is much easier to blend, easier to erase, and horrible to put any kind of point on. This was a mighty frustrating week. The line drawing above is about 15 hours worth of work. I know this wasn’t an easy drawing to do even for a Bargue drawing. I do think, however, that I’m learning more because it is an increased level of difficulty. I don’t know what I was doing wrong with my measuring, and next time, I will be even more careful at the beginning and document my line lengths. I began adding the darkest shadows to the drawing, and look at this! Yes, there are many things I have to fix (thank you charcoal…) and this is about an hour and a half of additional work. So the one thing I truly understand is that measuring is hugely important. Because I was able to get those lines precisely where they belong, the short time I put into this sketch working on the shadows is a likeness of the original! Never mind that I don’t have any of the subtle shading in place. Since the lines and proportions are correct, it reads as the same person. Here is where I ended up, I ran out of time. I may come back to finish it later. I’m already much better at discerning differences. I still need to work on my grey scale. I could easily spend all my time drawing, I’m falling in love with it all over again. Rose started us with blocking in tonal shapes, not letting us use many measurements. I think she wants us to get a feel for the shapes and worry about measuring it later. The kneaded eraser doesn’t leave crap all over the drawing or the table and erases more cleanly. Who knew? Rose did of course. The energy in this simple painting is amazing. I thought it was all about the curves, and the more I looked, the more I realized it’s all about triangles. There are relationships EVERYWHERE. The elbow to the nose. The end of the hook through her skirt to her elbow. Left elbow to the hat. Even her head with hair makes a triangle. It is simply amazing. These relationships are what keeps the eye focused on the painting. I knew I liked it when I picked it, and I had no idea why until I actually LOOKED at it. I thought; corset, Irish, wench, sea. Then, I saw relationship, relationship, relationship, and more relationship. I only detailed a few of them in my drawing. I sincerely doubt that I will ever plan my paintings the way I used to ever again. This alone will take my art to the next level. I’m already pulling my hand away from the drawing to do the measuring. Each day I use that skill I get better at it. Today was difficult again because holding my arm still while outstretched is a completely new thing to do and I have to develop those muscles. 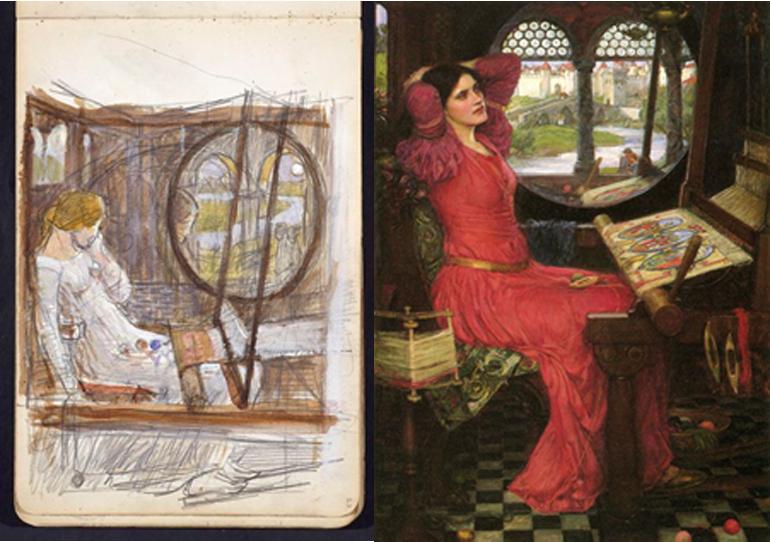 In looking at master drawings I found some of Waterhouse’s preliminary sketches. 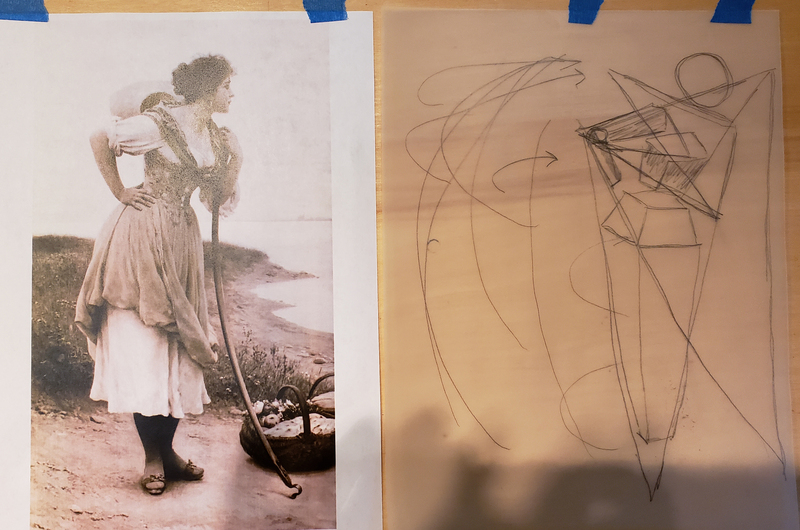 This is a preliminary sketch for Lady of Shalott and the finished painting. His sketches look a lot like mine! This is an incentive for me to stop judging my initial drawings. This is all about getting the idea down on paper so that you don’t lose the thought. Fleshing it out happens later. It is nothing more than shorthand; a mnemonic reminder of the image in an artist’s head. I have barely started my drawing for the next class. I’m too busy exploring all the other wonderful stuff I’m figuring out as I go along! I finally found a classical atelier where I could take classes here on the Big Island, and classes began this month. I have permission from my teacher, Rose Adare, to post my insights from our classes here to my blog. As you may know, I’m almost completely self-taught, since I didn’t have any interest in painting until I moved to Hawaii in my 40s, and believe me, I am well aware of the gaps in my knowledge and constantly strive to correct them. Here is my first drawing after the first class. I picked this image because I thought it would be easy. Funny me. Early on, I realized the importance of padding my drawing paper. The texture from my drawing board was coming through on my actual drawing. Measure once. Mark. Measure twice again, from different directions. THEN make a darker mark. It is important to begin a drawing with lighter lines, and this one I have to work on. It leaves room for changes. Darker lines seem more complete and close off a drawing from further improvements both physically and emotionally. I’m too lazy to use multiple pencils at this point. I’d rather use one and figure out how dark is dark using pressure than having to figure that out for multiple pencils. It isn’t finished, and it is significantly better already. I used a 5B pencil rather than the 2B I used on the first drawing. 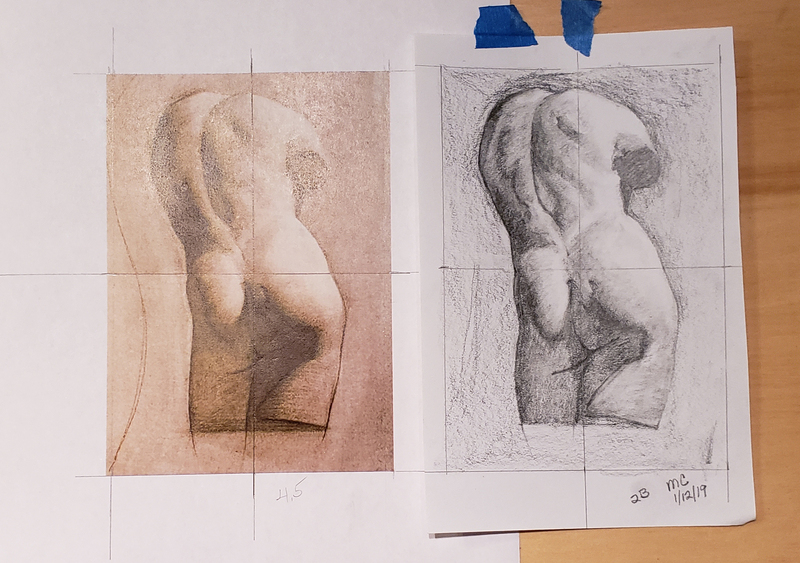 Even during the second drawing my measuring skills have increased dramatically, especially since I am measuring with my left hand while drawing with my right. This is the sight-size method, we are drawing images the same size as the original. Not having to adjust for scale (increasing or decreasing the size of the original image) makes this process much easier. No grid, no ruler. 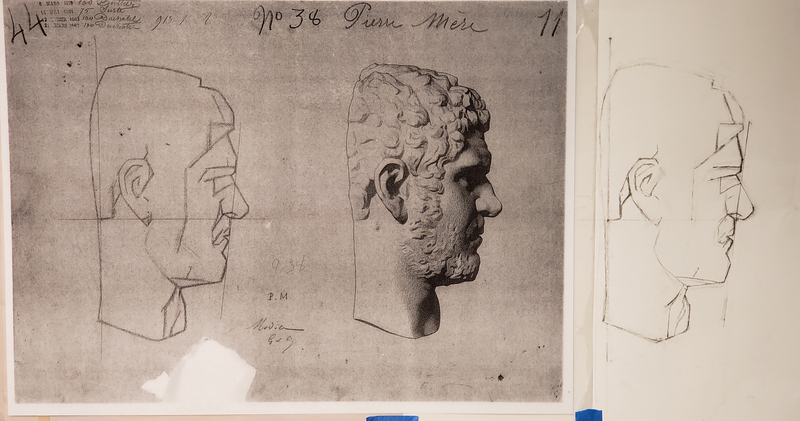 We use a bamboo skewer or a pencil to measure from the master drawing to the paper. Not to worry, I continue to paint at the same time! 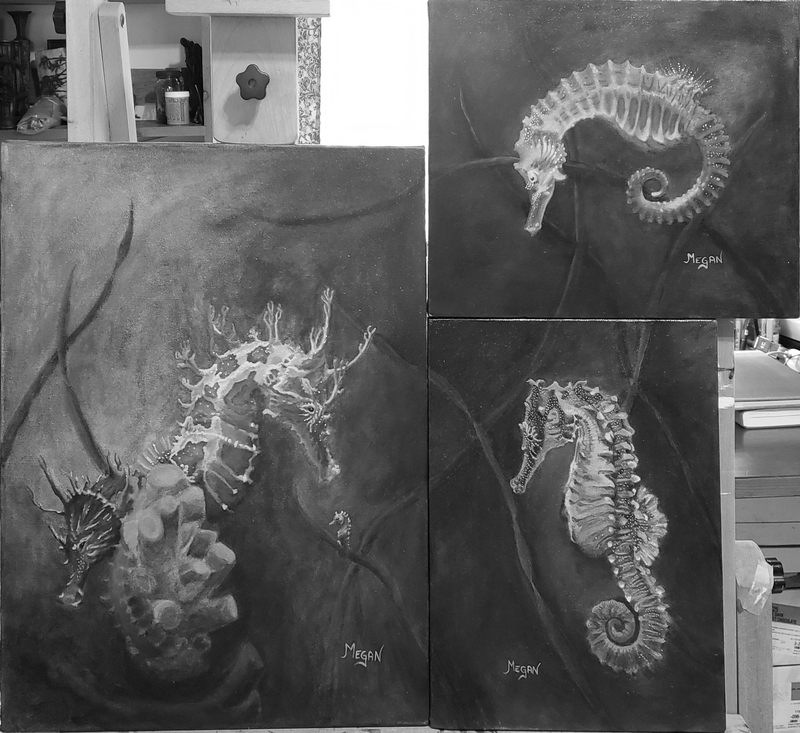 Seahorse update to follow!